BUYSOUNDTRAX Records presents FIREFLY: MUSIC FOR SOLO PIANO, featuring music composed by Greg Edmonson for the cult classic television, produced and performed by pianist Joohyun Park. FIREFLY was a science fiction series produced by Joss Whedon for the Fox network in 2002 and was quickly cancelled by network executives who did not understand the show and were not interested in giving the show more time to find its audience. FIREFLY’s cast included Nathan Fillion, Gina Torres, Alan Tudyk, Morena Baccarin, Adam Baldwin, Jewel Staite, Sean Maher, Summer Glau and Ron Glass. While the show had a short life on television, fans immediately and intensely discovered the show when it came to home video and this passion kept the spirit of the show alive to such an extent that Universal produced a feature film version to continue the story in 2005. Born in South Korea, Joohyun began studying music at the age of six at the prompting of her mother. Eventually she received both a Bachelor’s and a Master’s Degree of Piano from Yon Sei University in Seoul, studying with pianist Myoungwon Shin, before relocating to the United States, where she earned a Bachelor’s Degree in Contemporary Writing and Production from Boston’s famed Berklee College of Music. Joohyun's orchestrations and arrangements can be found in films such as PRIEST, DRAG ME TO HELL, CREATION, WHEN IN ROME, LOVE HAPPENS and many other films. Joohyun has recorded several solo piano interpretations of film music for BSX Records, including the 2012 release MUSIC FROM BATTLESTAR GALACTIA FOR SOLO PIANO. “I always start a project like this studying the piano arrangement and the original soundtrack recording,” Joohyun explained of her process in preparing for this kind of project. “Sometimes I follow my own interpretation and sometimes I perform it exactly the way it is. For FIREFLY, there were many beautiful solo guitar tracks that I wanted to mimic faithfully. 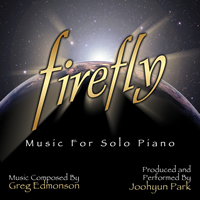 In addition to the dozen piano interpretations of the FIREFLY score and its theme, composer/arranger Dominic Hauser has produced a vocal rendition of the title song, respectfully performed by singer Brian “Hacksaw” Williams (RACER X, DELTANAUT). BUYSOUNDTRAX Records presents FIREFLY: MUSIC FOR SOLO PIANO. The booklet includes liner notes by author Randall Larson, including recent insights from the composers on the creation of this project. FIREFLY: MUSIC FOR SOLO PIANO is a limited edition release of 1000 units. The first 100 copies will be signed by composer Greg Edmonson and pianist Joohyun Park.